On Wednesday, my daughter and I went to see the movie “Maleficent”. My interest on seeing that movie had nothing to do with watching Angelina Jolie with the overgrown cheekbones; it was more because it seemed to be an interesting take on the story of “Sleeping Beauty”. I liked how the story dealed with the whole Maleficent character. I never liked how in children’s stories the evil character is all black without any good feelings at all. I’ve always liked how in japanese animation or anime, the evil characters have always been portrayed as complicated beings dealing with their good sides. Each one of us has a bad side and a good side. We all have the choice to choose which side we are gonna let loose in our lives. What makes more sense is how we can’t predict which side of us will be the winner. We should want the good side to take over but I often find people wanting the bad side to win. They even feel proud when the bad side gets what it wants. The Apostle Paul wrote in Romans 7:14-25 “We know that the law is spiritual; but I am unspiritual, sold as a slave to sin. I do not understand what I do. For what I want to do I do not do, but what I hate to do. And if I do what I do not want to do, I agree that the law is good. As it is, it is no longer I myself who do it, but it is sin living in me. I know that nothing good lives in me, that is, in my sinful nature. For I have the desire to do what is good, but I cannot carry it out. For what I do is not the good I want to do; no, the evil I do not want to do — this I keep on doing. Now if I do what I do not want to do, it is no longer I who do it, but it is sin living in me that does it. So I find this law at work: When I want to do good, evil is right there with me. For in my inner being I delight in God’s law, but I see another law at work in the members of my body, waging war against the law of my mind and making me a prisoner of the law of sin at work within my members. What a wretched man I am! Who will rescue me from this body of death? So we all have a little maleficent in us: our flesh. 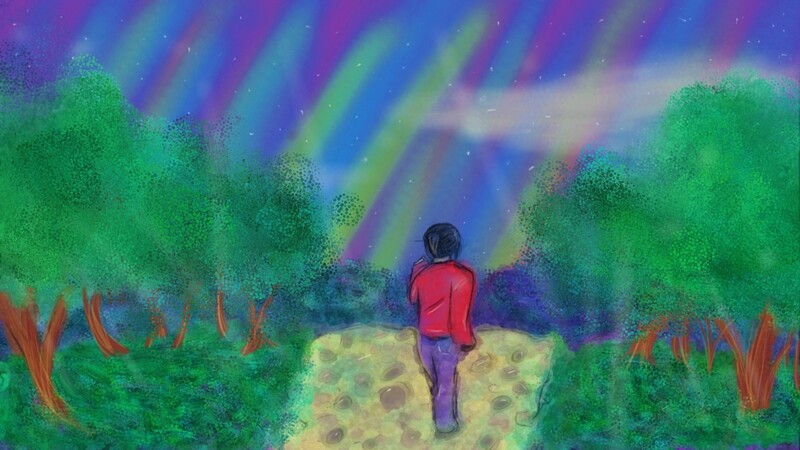 It constantly fights with our spiritual side, I will call it: beneficent. Now the question is: who will YOU let win the fight for YOUR life? Beneficent or Maleficent? Choose wisely and you may enjoy eternal life. 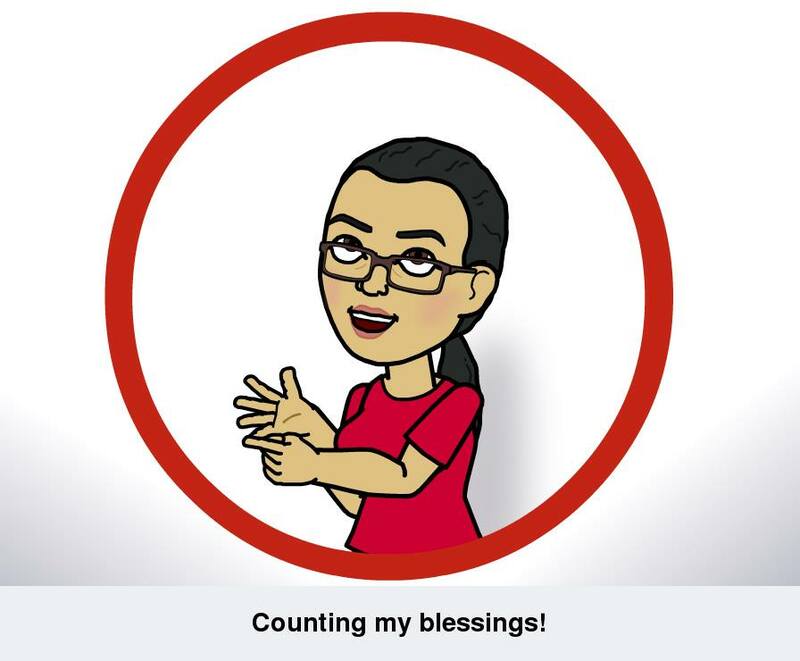 God Bless You abundantly! 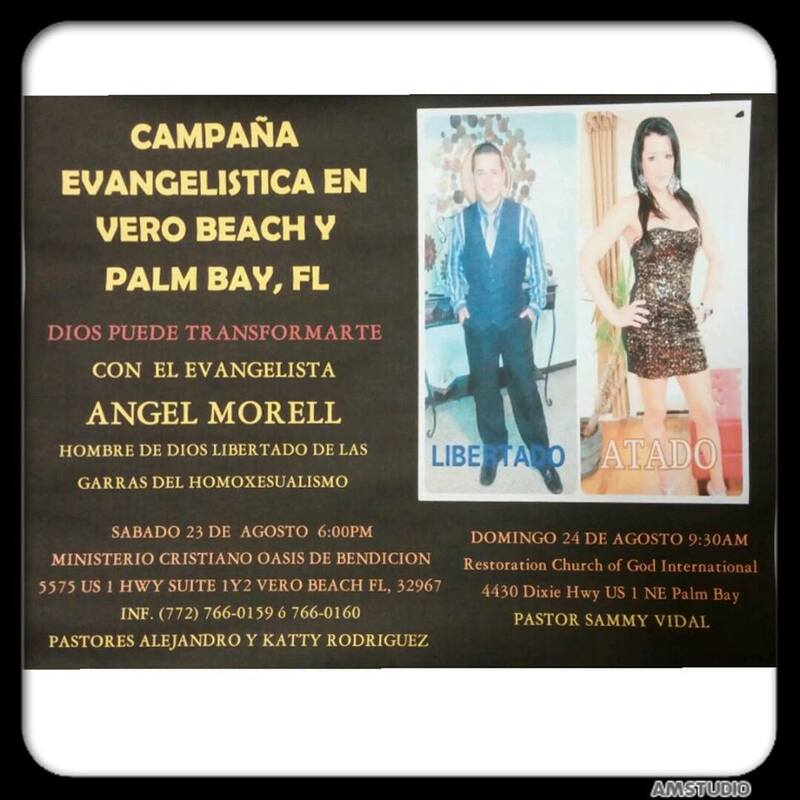 For those of you who live in the U.S.A. (specifically in the Florida area) and if you are interested in witnessing how God can transform a young man from the claws of sexual abuse, drugs and homosexuality into a servant of God: know that Evangelist Angel Morell will be visiting Vero Beach & Palm Bay in Florida on August 23 and 24. The above image has the phone numbers and addresses about these glorious services. He will also have available his powerful testimony in DVD. More info about that on his Facebook page. Dadda….that’s one of the first words that a baby says when they’re still toddlers. It’s easier to pronounce the consonant “d” than the consonant “m”. Kinda frustrating for all of us devoted mothers. But there are still devoted fathers out there. Not in the majority; but they are still there. Well, these thoughts go for those devoted fathers who are awesome enough to not just think about themselves; but to live to see their offspring thrive and become honest citizens of this society. We need more fathers like them. Fathers who will dare to take a challenge of being real men by assuming their responsibilities. It is often believed that a boy becomes a man when he lays with a woman. But that is not true. A boy becomes a man when he is unselfish enough to make a difference in the lives of those who surround him; starting with his family and then to his other acquaintances. A real man is not just smart; a real man seeks wisdom. A real man is a good servant of God; he loves God with all his heart, mind and soul. A real man is a good son; respecting his parents and honoring them. A real man is a good husband; considerate, faithful and kind to his wife. A real man is a good father; by being a good example, a counselor, a guide and a provider. There is no perfect man in this world; the same way as there is no perfect woman. Both will make many mistakes until they reach a certain level of maturity and wisdom. But the effort of reaching that goal has to be seen and it’s not worthless. I always like that saying that says: “a man is tall when he falls on his knees”. It’s a beautiful thought. 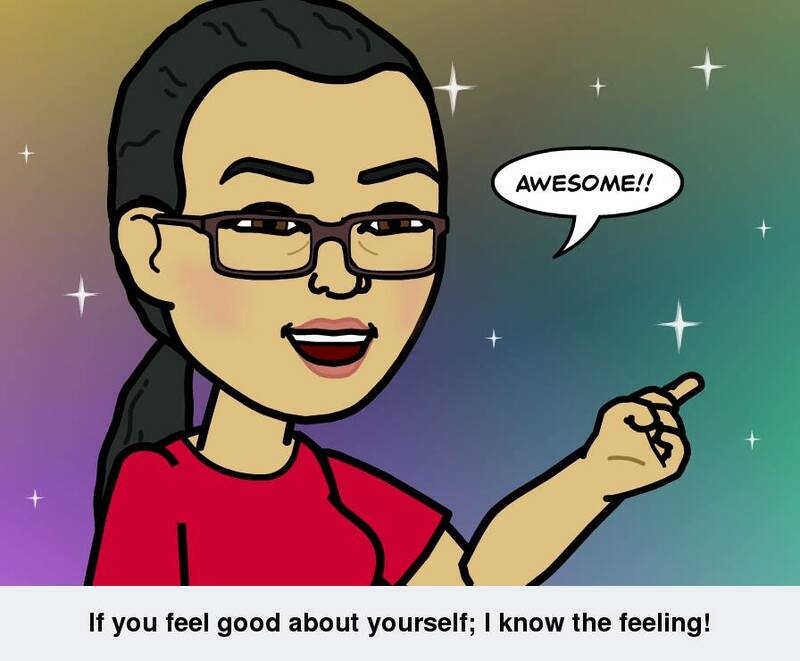 Humbleness makes a person great. But why did I mention Psalm 27:10 as the beginning verse? Well, it is law of life that our parents should leave this earth before us. Unfortunately, it’s not always like that; but that’s another sad story. But this thought is for all of us who have lost a parent because of that law of life. While your dad is still alive; tell him that you love him, hug him, talk with him, give him a call, take him to his favorite restaurant, take him a movie. If your dad is sick, make sure he has everything he needs to make his illness a less painful experience. If your dad hasn’t been the best dad: forgive, forget, ask for forgiveness. Heal your heart with feelings of love, warmth, mercy and grace. If your dad is gone (like mine); remember him, treasure the good times, share with your kids those experiences that they may enjoy to know and eventually, they will share them with the next generations. Keep the memories alive and honor them. Our Father in Heaven will father us in the meantime. Enjoy your weekend. 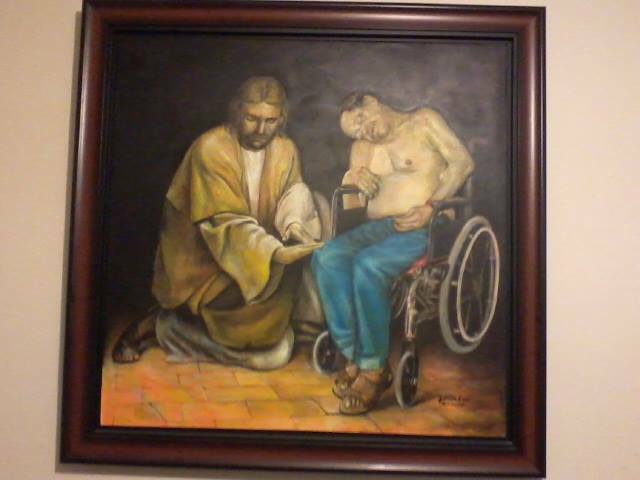 (Painting was made by my uncle Frank Cruz) Representing my sick dad being touched by the merciful hand of Jesus. I Fixed The Comments Issue! 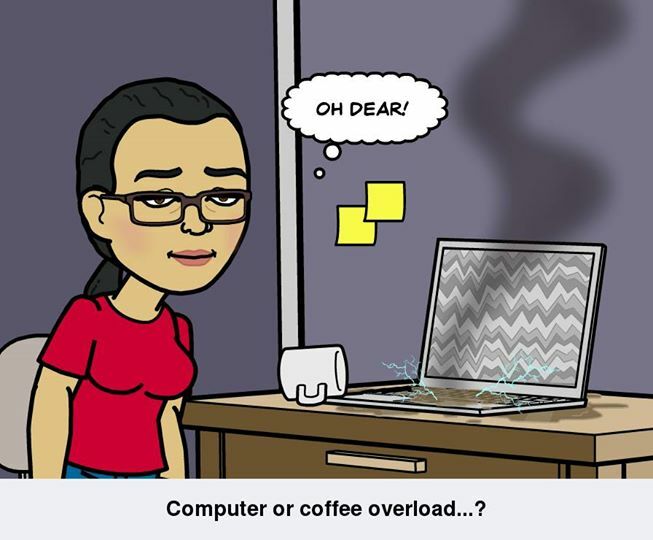 I really apologize to my readers because the settings in my dashboard didn’t allow to make comments on my posts. This was not done on purpose. I had no idea what was causing the problem and I tried to fix it and succeeded. I changed the settings many times but for some reason some of my posts couldn’t be commented and others could. Now if you have a comment on any of my posts you can comment freely because the problem was solved. I will gladly reply to you. I’m really sorry about this past situation and I hope it doesn’t happen again. Thanks for your understanding and support. God Bless You all! I know it’s not your fault that your kind was brought to this island. I also know that you are running free without any natural predators that could stop you. You are not from this place, iguana; you were brought here by people who could care less about the dangers that they could do to our ecosystem. 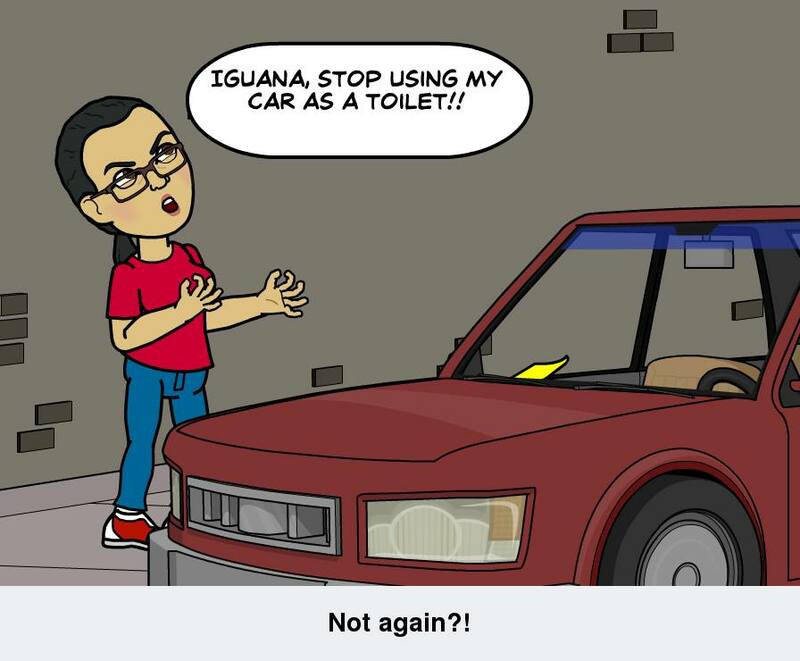 Iguana, I don’t want to harm you; but everytime I go to my car and see your droppings all over it, I can’t help but get mad. Today, while I washed my car, I was talking to you. Yeah, I know that it sounds crazy, iguana. But you have bothered me more than you will ever know. I can’t help to park my car under your favorite tree. That parking was assigned to me. But you have transformed my car into your own personal toilet and while I was washing it today; apart from being truly disgusted by the stench, I wished that the guys who work in the chinese restaurant near my apartment would capture you.